Lifelong programming and automation enthusiast with common sense always seeking more purposeful ways of working. Over time gathered experience from embedded to enterprise, self-employment to international corporations, but mostly from web-related work in small, ingenious companies. I want to be Linus Torvalds instead of Linus Torvalds - in other words, I seek to eventually give something delightful back to the world at large; probably via automation. I hope to deliver long-lasting, deeply satisfying solutions, and spread related abilities around me. I yearn to learn new areas of expertise and understanding through cooperation with enthusiastic professionals. User experience could be next. At Futurice, I have helped the company build a team to provide continuous small-scale software development service. At Solinor, I introduced test and deployment automation and helped the company grow in a variety of positions. At DEM Solutions I turned a chaotic support/development requirements gathering process into a smooth one. At a mobile network corporation I radically optimized performance of complex databases. At Elma Oy I made a successful replacement for a design dead extranet application framework. At To the Point Oy my scripts were used in many large high-quality new media presentations. I have autonomated and administered complex production environments at several places. My customers were happy with my services when I ran my own company. Growing a team and developing multitier services in clouds, mainly AWS and Azure. Automating deployments for a large enterprise system. Figured out clean code, clear architecture and continuous delivery with a team. Oversaw, facilitated and scripted operation of PCI DSS compliant systems. Automated testing. Developed a proxy in PHP and CI utilities with Bash and Perl. Java, C#, C, C++ with wxWidgets, C#, Perl, databases and scrum master in multinational, multisite teams. Postmaster. Unix systems integration, internal service design and development. Created processes and tools for support while managed it and helped develop J2EE systems for Sonera. Web server and application provider. Software developer, both alone and in teams. Extranet solutions with Perl, C and Informix. Rolled own AJAX. Planned and implemented IT for local Internet cafe and book publisher. Created development speed boosting framework with Macromedia Director Lingo. I cherish Finnish as my mother tongue. My International English borders on excellent. I can understand Finland's Swedish. Undergraduate of Kallion Lukio, 1989, specialized in theater lighting and sound. Four years of Computer Science at University of Helsinki, 1993-1997. I felt I learned more at work. I have some experience on J2EE but have mostly been able to avoid it. I know UML coarsely, preferring to draw diagrams mainly intuitively. I have implemented some GUIs with HTML, CSS, AJAX and WML as well as wxWidgets. I teach and use myself continuous, fully automated testing and deployment. I like to do user stories, use cases and/or given-when-then's tightly together with customers. I would love to actually calculate resource consumption and limits of the systems I develop. I define architecture and design on demand only. SOA is best with REST. I do possess very concrete understanding of data structures, algorithms, patterns as well as machinery underneath it all, analysis and the scientific method. I live happily at Malmi, Helsinki with my wife, dogs, car, 42" TV and three sons. I have sometimes been active in student, citizen, nordic larp, professional and neighbourial organisations. I compose, write lyrics for, and play rock music, read and write, but mostly play with my kids and enjoy vegetarian foods. Nowadays I like making small electronic gadgets and designing 3D printable objects. Occasionally I write some free software or design a board game. 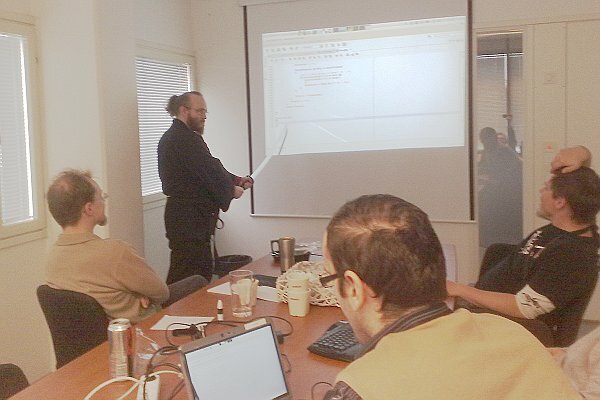 Kalle Hallivuori leading a Coding Dojo on Test-Driven Development.